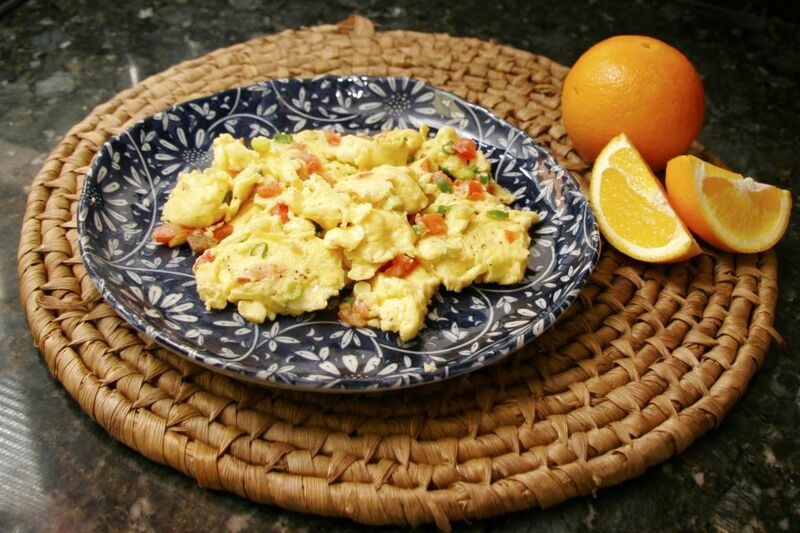 Chopped tomatoes, bell pepper, and cheese make these scrambled eggs extra special. Use cheddar, Monterey Jack, or a blend of Mexican cheeses in this recipe. Serve the scrambled eggs with sausages, ham slices, or bacon. In a mixing bowl, beat eggs, milk, salt, and pepper together until well blended. Melt butter in a large skillet over medium-low heat until hot; pour in egg mixture. Reduce heat. As mixture begins to set on bottom and sides of skillet, lift and fold over with a spatula. Cook, stirring gently until eggs are almost set but still moist. Fold in the chopped tomato, finely chopped red pepper, and green onion. Heat scrambled eggs through; serve immediately. If desired top with shredded cheese just before finished. Saute sliced mushrooms in butter; remove the mushrooms, add the eggs (and more butter, if necessary), and continue with the recipe. Add about 1/2 cup of diced ham or crumbled bacon to eggs along with the minced vegetables and tomato.